In preparing for the Spring edition of The Affordable Art Fair, Gallery Director Carol Caiger wanted to have a chat with me about the use of the enso in my practice and to enquire a little more about its’ significance to me and my creative and well-being habits. Find below the notes and my answers. Enso is the Zen Bhuddist practice of drawing a circle with a single or two part uninhibited brushstroke to express a moment in time. That for the artist is when their mind is free to simply let themselves create through the physical body. 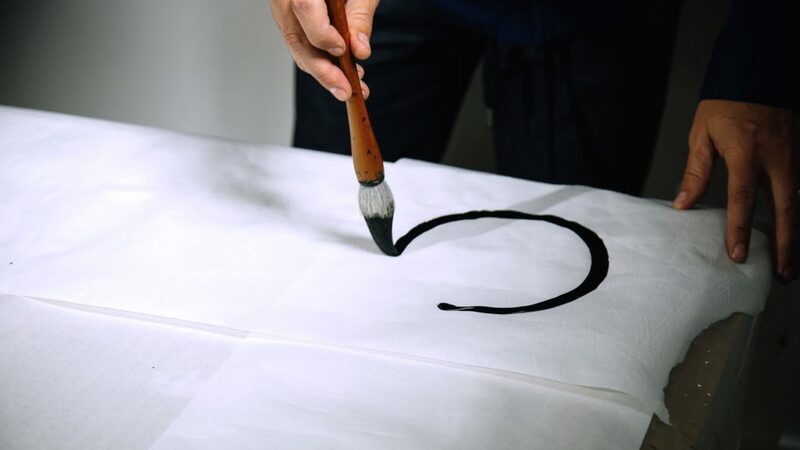 In Zen, enso is a circle that has since ancient times been written with canes or sticks in midair, wet brushes on the ground or with ink on paper. At first glance the ancient enso symbol appears to be nothing more than a miss-shaped circle but its symbolism refers to the beginning and end of all things, the circle of life and the connectedness of existence. It can symbolise emptiness or fullness, presence or absence. All things might be contained within, or, conversely, excluded by its boundaries. In Zen it can represent the perfect meditative state of enlightenment. Enso may symbolise many more things including: strength, truth, single-mindedness, the entirety of the universe, equality and the void. The circle may be open or closed. In the former case when the circle is incomplete, it might speak of imperfection as an essential and inherent aspect of our existence. Zen practitioners relate the idea to ‘wabi-sabi’, the beauty of imperfection. When the circle is closed, it may represent perfection like a mandala. There are so many definitions available, that each of us is left with the responsibility to select or create our own interpretation of the enso that reflects our hearts and minds. For me the enso is a manifestation of the moment. It is important to me to maintain as a meditative discipline. Cultivating mindfulness and living in the present. It is also a symbol for creation through contemplation and for life as a continuous reflective journey. When you believe that you have arrived at some final destination on your path, enso reminds you to start again exactly at the point where you are now and to embrace and enjoy your unique experiences on life’s journey. For me the enso signifies the many dualities within life and the imperfection of all things. It is a symbol that combines the visible and the hidden, the simple and the profound, the empty and the full, spontaneity and intention. It is about acceptance. A single brush stroke that cannot be modified. Connectedness. It is a pursuit of observing a moment that is wholly perfect and somehow incomplete in its’ isolation. It is, as are we, all connected to that (moment) which came before and that which follows. It is, as we are connected to all things. It enables a deep expression of individuality with variations in ink tones, brushstroke thickness, shape and direction of the circle and even the positioning of the single point where the circle begins and ends. Yet the universality of the circle allows it to be read by others. Connecting with them and sharing in the moment of creation and observation. I noticed over many years that sketches made during meetings, doodles on note pads whilst on the phone and expressions of thoughts and feelings in journals and sketchbooks were becoming more and more abstract. These over time became refined to a number of repetitive motifs. The circle was one such obsession. Research took me to look at its significance within sacred geometry that led to Zen Buddhism. In parallel I was looking towards the east for approaches to quieten a busy mind in a hectic self-employed London schedule. With an ambition to build a balanced creative life that supported my well-being. The synchronicity of life goals and creative musings was something that answered a need to create an integrated and authentic life. 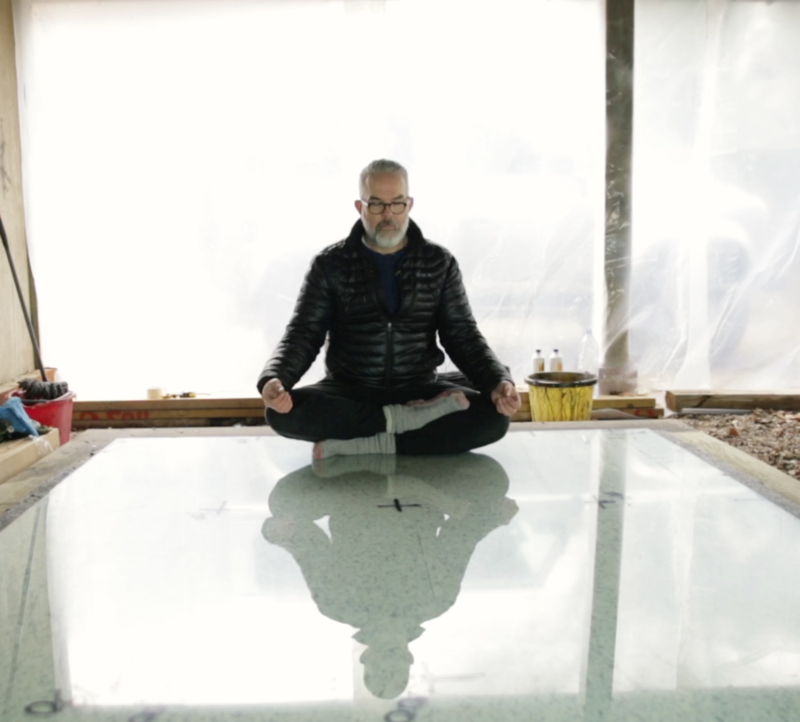 So reading about Zen, practicing yoga with meditation and breath work, running, trekking up mountains and forging creative rituals from unconscious habits was the start of a new studio practice. I have not regretted a thing. I think my approach to mark making is a synergy of these well-being habits and a creative practice. Having a good relationship with my body, understanding my breath and the flow is vital in creating the table top work or larger works that are rehearsed and embodied in muscle memory and created with the breath. Yes, I have off days. When the fear of making a mark is too caught up in a loop of judgement, or my thoughts on the intentions for the day or the specific piece of work are not clear. So I have a set of strategies that move me from inertia, stuck in inactivity to creating, to a state of doing. Sometimes it is as simple as observing the breath before embarking on a table-top of enso. Other times when this does not shift the ‘mind-monkey’ chattering away to me. I step it back to do some of the highly repetitive preparatory work, where completing the task is enough. That through observing myself; cutting paper, stretching canvas, priming or any other such activity, I shift away from over thinking into action. I find then that I am present in the moment. Mindful. I refer to my paintings as active meditations, but the mindfulness does not start and stop at picking up the brush with ink and putting it on the paper. There is so much unseen. It is all of what you can see and what you do not. My studio days generally start, before I arrive in the space. I like to take advantage of my location and run in the Kent countryside, by myself or with my dog. Failing that a long walk. It serves two purposes, it tires him out so he settles and it gets me ‘in my body’ and very connected with my breath. Both vital to my work. When I go to the studio I would generally start with my rolling out Chinese mulberry paper over a table-top. Selecting a brush, pouring and mixing the ink in a bowl and focusing on the paper. Thinking to myself what size circles, single or two-part stroke and bringing my attention back to my breathing. This creative habit came out from a desire to ritualise my arrival at the studio and signify the start of work. Clearing my mind of what I was thinking or doing beforehand and becoming focused. Visualisation of the gestures and movements, walking through with a dry brush with a few light yoga moves also eases me into creating the larger rehearsed works. I have researched many inks and papers for their respective characteristics over the years, to find the right ones for me. The mark I make I want it to be within the paper. Needing the pigment particle to be small enough to filter through the delicate papers fibre and bond with it throughout its thinness. It is not enough for it to be on the surface. The ink within the paper is the moment held in time. I liken the desire for this permanence of mark to the leached pigments into the rocks of cave paintings, great Italian frescos and tattoos. The inks I work with are all natural, they do not have any plastics or chemical preservatives within them. The provenance of all my materials is important and I work with archival and preservation thoughts in forefront of my mind. Which has led me to find recipes for the glues that I use from manuscripts in the British Museum. My brushes are equally important, and I have tried to source the best brush for the best mark. Interestingly my brush collection will reveal that they can be found in all places. Not just expensive art shops. I do have a beautiful traditional Chinese brush called Big Babba, but also a set of traditional sash brushes made from wood, brass and bristle for the building trade to home made brushes from cotton cord (the same material floor mops are made from) for its great ink retention and flow. 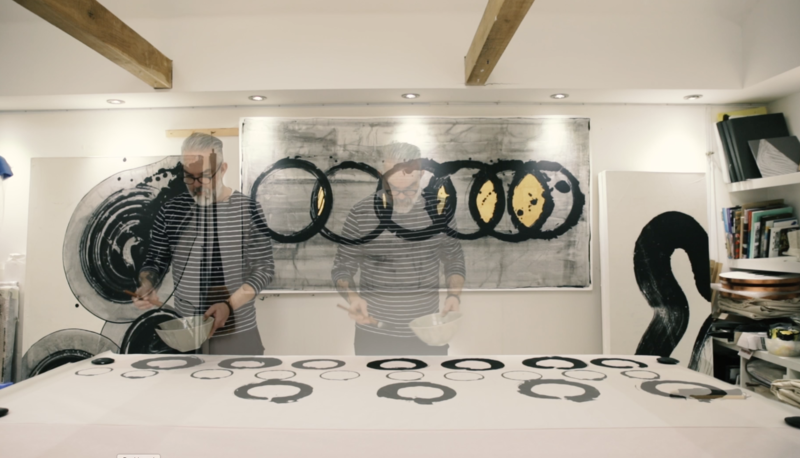 The returning to the enso circle is a repetitive act of skills and knowledge development of the craft of ink painting. Where a collaboraton between self, the brush, the ink and paper exist. I go between open and complete zen circles in my work for the different readings as I have said. I do like the challenge of attempting a perfect complete circle in one stroke and I think this is the one I do more often in my table-top practice. I also enjoy over loading the brush with ink, to cultivate the drips leading to the start or from the conclusion of the gesture, as with the ‘Moment Before’ or ‘Moment Within’ series. I enjoy talking to people about my work and hearing their connections, but before this engagement comes an initial, stop and look. I observe a moment when they offer themselves to the work. The work is a gift of the moment in time it was created to those that chose to gaze upon it. I believe it becomes an opportunity for them to press pause on what they are thinking and feeling, to suspend judgement on themselves and look. I see them draw their breath in tune to the rhythm of the flow within the work. It becomes perhaps, like the Zen master would create an esno for their students, a portal (focus) for their own meditation. I think it was Brancussi that said of his sculptures; “I bring you pure joy”. If my work can engage the mind, lift the mood and offer a moment of reflection and calm. Then I would feel it has communicated my intentions. My work is often created in a series or collection, so titling individual pieces is a process under constant review. I have a title for the over arching intention for the new body of work, as well as responding to working in the present. However once complete there is a story the work has to tell me. I revisit it many times during and after the various mounting and display processes. But am mindful that my titles are only just suggestions, as the interpretation and attachment to the work is no longer mine when I present it. My art practice is completely embedded in my life. Being an artist is a lifestyle choice as well as a career for me. I returned to making art full-time in 2009. Leaving a successful career in academia and arts management. The past 8 years have been amazing. Developing a painting practice that is genuinely driven by my need to make sense of my experiences, the world and myself and connecting with others, and finding an audience for this. Creative and well-being rituals such as running, yoga and meditation support my time in the studio. That as a 40 something year old, it feels I have manifested the life I want and need. And am creating the work I should be making. Living more authentically and contributing. Yes, they are all pillars supporting my well-being and my painting practice. I miss them if they are not attended to. Similarly I miss painting and time in the studio to play, the research and development time. I strongly believe in thoughts held within the field of Positive Psychology. Do more of what makes you happy and energises you and temper the amount or stop that which does not. They are essential elements within a daily routine that may have an allocated time to them. Or I will catch myself finding somewhere quiet and taking a quick ‘time-out’. I would rather practice little and often than set up a self-limiting belief it can only exist at these locations at these times. Simply put, these things make me happy and a happy Rod is a more creatively productive Rod.